Republican presidential candidates Texas Gov. Rick Perry, left, and former Massachusetts Gov. 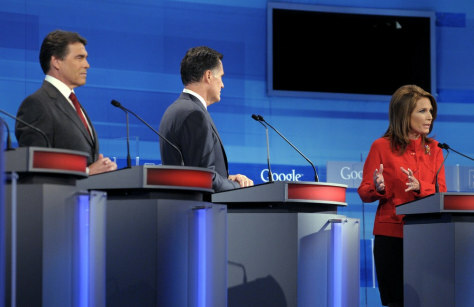 Mitt Romney, center, listen as Rep. Michele Bachmann, R-Minn, makes a point during a Fox News/Google debate Thursday, Sept. 22, 2011, in Orlando, Fla.